“Appellate Mediation in Pennsylvania” will be held on Monday, December 7, 2009 in Philadelphia and simulcast to Mechanicsburg, and on Wednesday, December 9, 2009 in Pittsburgh. It has been approved for 3.5 hours of CLE credit in substantive law. Nancy Winkelman, former 3CBA President is one of the organizers of the program and the panelists include 3CBA members Kim Watterson and Chip Becker, as well as 3CBA liaison judge, the Hon. D. Michael Fisher. Register 3 or more business days before the scheduled presentation and qualify for the Early Registration Discount. See the flyer for further details. Please direct any questions to PBI, 1-800-247-4724 or www.pbi.org. The Programs Committee has been active in coordinating CLE presentations for the 2009 Third Circuit Judicial Conference with the assistance of the staff of the Circuit Executive and Judge D. Brooks Smith of the United States Court of Appeals for the Third Circuit. As with the 2008 conference, the 3CBA has co-sponsored the welcoming reception and has organized two programs and a luncheon speaker for the last day of the conference. The first program is Certification of Questions of Law to State Supreme Courts which will be moderated by 3CBA Board Member Bob Graci and features Chief Justice Ronald D. Castille of the Commonwealth of Pennsylvania, Chief Justice Stuart Rabner of the State of New Jersey, Chief Justice Myron T. Steele of the State of Delaware, and Third Circuit Judge Smith as panelists. The written materials from this programs is available here. The second program is Ethics in Appellate Practice moderated by Lawrence J. Fox, Esquire, of Drinker Biddle, LLP, and a panel including Judge Julio M. Fuentes of the United States Court of Appeals for the Third Circuit, David R. Fine, Esquire, of K&L Gates, LLP, and Lisa B. Freeland, 3CBA Board Member and Federal Public Defender for the Western District of Pennsylvania. The 2009 Appellate Luncheon speaker will be Professor Paul D. Carrington of the Duke Law School who will address Recent Proposed Reforms for the U.S. Supreme Court. In April of 2008, the 3CBA hosted two CLEsessions at the 2008 Third Circuit Judicial Conference: Dos and Donts of Effective Appellate Advocacy had as faculty members Judge Dolores K. Sloviter, Judge Thomas A. Ambro, Judge D. Michael Fisher, Patricia Millett, Esquire of Akin Gum Strauss Haver & Feld LLP, and Virginia Seitz. Esquire of Sidley Austin LLP with 3CBA President Nancy Winkelman acting as moderator; Ins and Outs of Appellate Motions Practice had as faculty Chief Judge Anthony J. Scirica, Judge D. Brooks Smith, and Margaret Wiegand, the Legal Coordinator in the Third Circuit's Clerk's Office with 3CBA President-Elect James C. Martin acting as moderator. The Programs Committee developed the content for the motions practice panel. The 3CBA also hosted a reception for all of the attendees at the Circuit Conference and a luncheon for appellate practitioners featuring a spectacular presentation by Thomas C. Goldstein, Esquire, co-chair of Akin Gump's Supreme Court Practice Group, about how he built one of the country's most active and flourishing Supreme Court practices. True to our goal of presenting quality programs in all parts of the Circuit, in May the 3CBA put on a CLE program in the Virgin Islands about the new Virgin Islands certiorari process, which was attended by over 75 Virgin Islands practitioners. Serving as faculty for that course were: Chief Justice Rhys S. Hodge of the Supreme Court of the U.S. Virgin Islands, Judge Marjorie Rendell, Adriane Dudley, Esquire, and 3CBA Board Member Peter Goldberger. 3CBA Board Member Andrew Simpson from the Virgin Islands assisted in planning this program. Also in May, the 3CBA partnered with the New Jersey Bar Association's Federal Practice and Procedure Section and Appellate Practice Committee, and with the Association of the Federal Bar of New Jersey to put on a program, The Nuts and Bolts of Practice Before the Third Circuit, at the New Jersey State Bar Association's Annual Meeting in Atlantic City. Former 3CBA Board Member Mary Gibbons Whipple helped in organizing this program and served as its co-moderator along with Edward T. Kole, Esquire. The faculty for this program was: Judge Michael Chagares, former Third Circuit Judge John Gibbons, 3CBA Treasurer and former New Jersey District Court Judge Stephen Orlofsky, and Third Circuit Clerk Marcia Waldron and Third Circuit Mediator Joseph Torregrossa. Our successful program, Do's and Don'ts of Effective Appellate Advocacy was reprised in the Eastern, Middle and Western Districts of Pennsylvania in November of 2008. 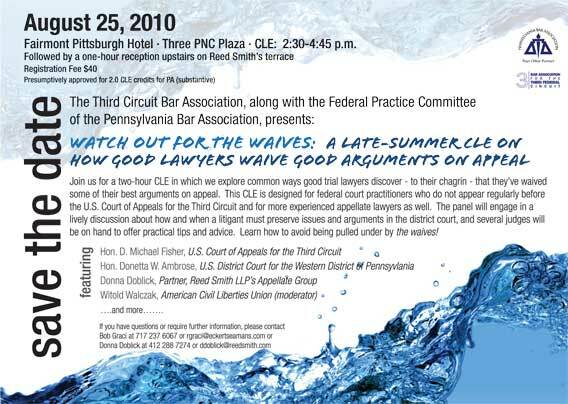 This program was co-sponsored by the 3CBA and the Pennsylvania Bar Institute. The 3CBA was involved in a recent program in New Jersey on the Third Circuit’s new electronic filing rules. 3CBA Board Member Stephen M. Orlofsky, Esquire, of Blank Rome LLP’s Princeton office participated on the panel, along with Bill Bradley and Charlene Crisden from the Third Circuit Clerk's Office, and Ann Gorr, a legal technology consultant. The Programs Committee has been active in coordinating CLE presentations for the 2009 Third Circuit Judicial Conference with the assistance of the staff of the Circuit Executive and Judge D. Brooks Smith of the United States Court of Appeals for the Third Circuit. As with the 2008 conference, the 3CBA has co-sponsored the welcoming reception and has organized two programs and a luncheon speaker for the last day of the conference. 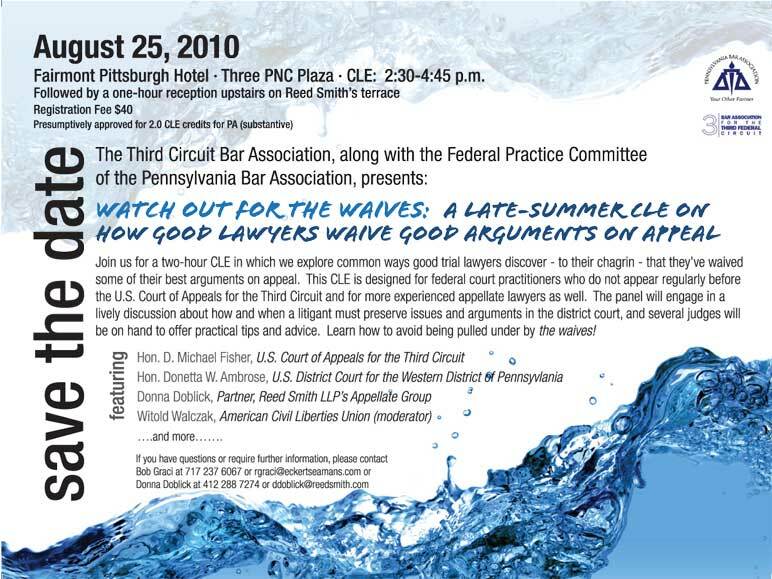 The first program is Certification of Questions of Law to State Supreme Courts which will be moderated by 3CBA Board Member Bob Graci and features Chief Justice Ronald D. Castille of the Commonwealth of Pennsylvania, Chief Justice Stuart Rabner of the State of New Jersey, Chief Justice Myron T. Steele of the State of Delaware, and Third Circuit Judge Smith as panelists. The second program is Ethics in Appellate Practice moderated by Lawrence J. Fox, Esquire, of Drinker Biddle, LLP, and a panel including Judge Julio M. Fuentes of the United States Court of Appeals for the Third Circuit, David R. Fine, Esquire, of K&L Gates, LLP, and Lisa B. Freeland, 3CBA Board Member and Federal Public Defender for the Western District of Pennsylvania. The 2009 Appellate Luncheon speaker will be Professor Paul D. Carrington of the Duke Law School who will address Recent Proposed Reforms for the U.S. Supreme Court. Anyone interested in planning a program or participating in the Programs Committee’s activities is encouraged to contact the committee chair or any member of the committee. Click here to email the chair of the Programs Committee, Bob Graci. Copyright © 2010 The Bar Association of the Third Federal Circuit. Disclaimer and Copyright. Website design and marketing by Integrated Technology Services, LLC .